And that’s better news for women than for men. Are you good at math? A computer whiz? Well, great! Presumably your “hard skills” are a surefire ticket to a high-paying job. Well, maybe that used to be the case. But it’s not necessarily so anymore. To land a lucrative job today, hard skills in math and engineering, for instance, may not be enough. As technology allows us to automate more technical jobs, new research shows that people skills — communicating clearly, being a team player — matter more than ever. And women appear to be the ones capitalizing on this shift in the workplace. It’s not that hard skills are suddenly less desirable. Training in mathematics, computer science and other STEM fields (what Deming would count as “high cognitive skills”) is still a great investment; that “plugging away at a spreadsheet” is still valuable. “High-cognitive-skills workers still earn more,” Deming said, “but social skills increasingly are a complement to cognitive skills.” He argues that having strong cognitive skills is a necessary but not sufficient condition for a high-paying job. Social skills have become more important for workers because they provide a crucial advantage over a frequent competitor: technology. A 2013 paper by two Oxford researchers projected that nearly half of U.S. jobs would be vulnerable to automation within 20 years. But “computers aren’t good at simulating human interaction,” Deming said. That means a job as a manager or consultant is harder to automate, and the skills those jobs require become more valuable. In his paper, published by the National Bureau of Economic Research last week but not yet peer-reviewed, Deming tries to precisely define and quantify social skills. For example, he said, “Can you work with others? It’s not necessarily whether you’re a nice person — though that probably matters — but it’s more about can you work in a team.” To categorize job skills, Deming used the Department of Labor’s Occupational Information Network surveys of worker occupations. He grouped job tasks into four types: routine, nonroutine analytical, social-skill-intensive and service-intensive. Routine tasks are repetitive and likely to be automated, like assembly-line work or checking ledger entries; nonroutine analytical tasks involve more mathematical or abstract reasoning, such as computer programming; social-skill-intensive tasks require persuasion, social perceptiveness and coordinating with others; service tasks involve assisting and caring for others. An accountant, for example, might perform all four types of tasks, but some more than others, and the job probably requires a varying level of skills in each task. It’s not news that jobs mainly requiring skills in the first category — routine work in manufacturing, for example — have declined sharply in the U.S. over the last few decades. At the same time, low-skill service-sector jobs (like janitorial and fast-food positions) have grown in number, if not in pay, and nonroutine analytical jobs (like computer programming) have grown a lot, at least through the 1990s. But an interesting thing happened at the turn of the century: “If anything, growth in high-wage, technical occupations slowed in the 2000s,” MIT economics professor David Autor said. Autor’s own research has documented how middle-skill, routine jobs (like those of machinists) decreased over the last few decades, whether through automation, globalization or some other factor. But Deming’s work “offers a couple of very nice insights” explaining the slowdown in the high-wage, technical jobs, Autor said. He thinks Deming’s paper raises an interesting question: Has there been a slowdown in growth of high-wage, technical jobs, or is there simply a shift in growth toward jobs that also require high social skills? It seems to be the latter. Deming found that most of the employment growth in jobs requiring cognitive skills occurred in those that also required interpersonal skills. Think of doctors, lawyers and management consultants. Purely technical occupations — those requiring knowledge of math but fewer social skills, such as actuaries, machinists, electricians, billing clerks — have fared badly since 2000 in both pay and job growth. Even jobs with low math but high social skills have grown — lawyers and physical therapists, for example. “Jobs with that description have grown across the board, not just at the top; they’ve also seen more wage growth,” Autor said. Dentists, in particular, have done really well. Deming finds that the composition of women’s job tasks has radically changed in the last 30 or so years, while men’s tasks have hardly budged. He ranked both the hard and soft skills requirements of more than 300 jobs and standardized them on a percentile scale (the higher the ranking for a particular skill type, the more important it is to the job). In 1980, the typical woman’s job was below average in its requirement for social skills — it ranked in the 47th percentile (think of a cook). But by 2012, the typical woman’s job was in the 66th percentile of all jobs in requiring social skills (think of a teacher). Over the same period, the typical woman’s job saw a decline in routine tasks, to the 34th percentile from the 58th. Men saw little change in their job tasks, however — the breakdown between routine and social tasks for the typical man’s job was pretty similar in 2012 to what it was in 1980. Deming also looked at the jobs where the female employment share grew the most, and sure enough, they tended to rank higher in social-skills requirements. That’s shown in his chart below. 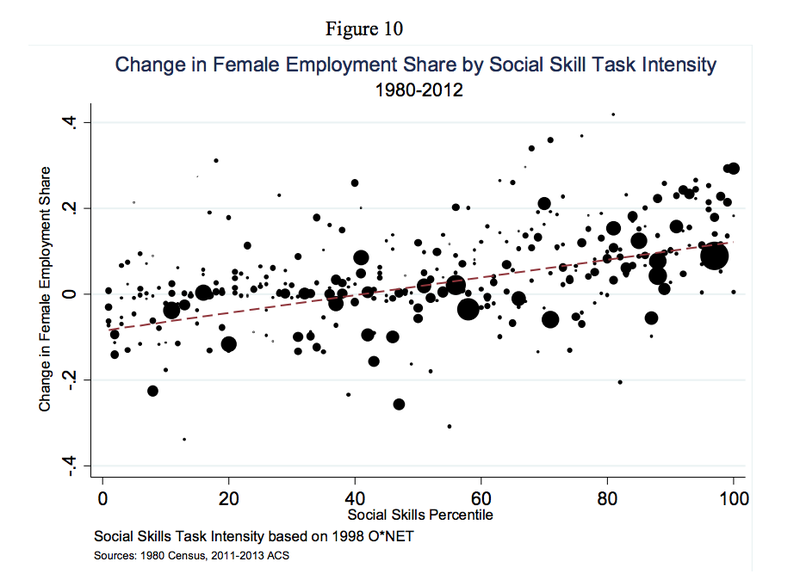 The y-axis shows the change since 1980 in the female employment share for a given job, while the x-axis shows where that job ranks in required social skills. The dot size represents how many people hold that job. The takeaway is clear: Women are getting jobs that require more social skills.